In just a few moments, I'm going to tell you precisely how I invented... and then built this awesome 10' X 10' backyard / outdoor movie screen all by myself in about 15 minutes... for less than $50 dollars on Sunday October 13th, 2013 - with no formal plans and just a single trip to the hardware store. But first, you need to know what motivated a guy whose motto, when it comes to home-fix-it projects is: "Measure once, cut twice. Also, you can call your dad or always run back to Home Depot 24 hours a day." The story you are about to read is 100% true. 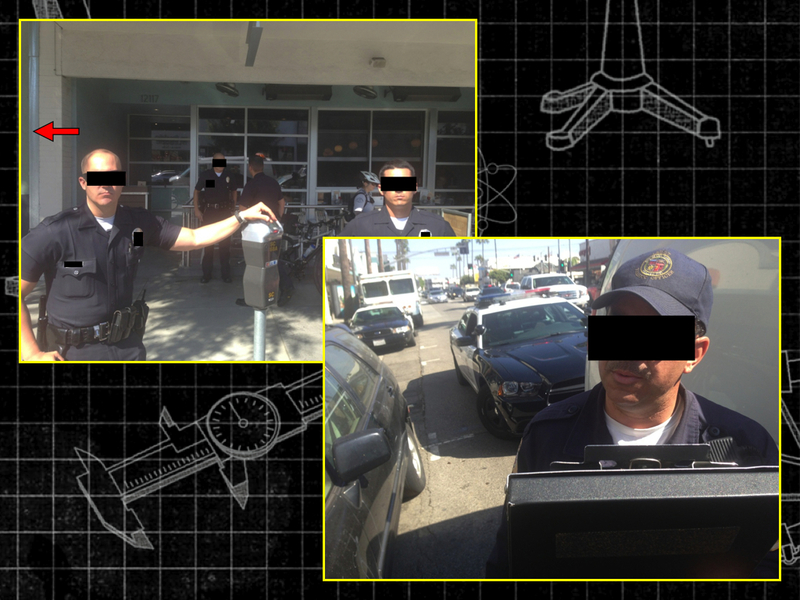 The City of Los Angeles and I are currently in a dispute over parking tickets, which they say I was issued... and which I did not receive. Now mind you, I'm not disputing the fact that on a few days in 2012 the Parking Violations Bureau gave me a ticket for putting my car someplace it didn't belong. Three times. I just never got them. As for what happened to tickets, I'm not in the speculation business. Anymore. Now I make TV shows. Anyway, when I became aware of the tickets -- through the DMV -- who refused to renew my registration because of outstanding parking tickets, I did what any honest, hard-working, patriotic American would do: I called a city clerk and yelled. I did the same thing to the clerk's supervisor. And the supervisor's supervisor. After filing a notice of appeal with the City over the tickets (as the supervisor's supervisor said)... I was instructed to wait 4 to 6 weeks & they would schedule a hearing. Cut to: Last week. After finishing an errand, I returned to my car and a man from the DMV was putting a boot on the front tire. I very calmly explained to him that he can't take my car to impound because I have not had my hearing yet. He said he had no idea what I was talking about. Then he urged me to step back... the tow truck would be here any moment. I asked to speak to his supervisor. He said he was the supervisor. Clearly, talking calmly wasn't working. So, I raised my voice (seeing as how well it worked the first time). I didn't raise my voice a lot. I wasn't some lunatic "Hockey Dad", rather I was more like... oh, OK, I raised my voice like a hockey dad. But, a hockey dad who was very much in control of his faculties, who is talking rationally, making 100% sense, and sternly, but with a nearly imperceptible increase in both volume and urgency. Turns out -- in California, talking sternly, rationally, and making 100% sense, but with a near imperceptible increase in volume and urgency results in the guy from the DMV calling the police for back up. Actually, five cops for back up. There was the four you see in the photo above, plus a supervisor who was nearby on a lunch break came by as well, you know, in case anyone with a smart mouth was going to get clubbed, he wanted a piece of the action. I think. I explained to the police that taking my car while actively involved in a dispute with the City was not how things are done - that it was not fair -- that I knew my rights -- and that it would be like me saying: I'm not going to burn your house down until we have a discussion about it. And then, before the discussion, I burn your house down. it was at this juncture the cop said: "Sir, if you don't move out of the way NOW, I'll put you in handcuffs in the back seat of the squad car until they take your car away." I stood frozen for a moment. On the one hand, I know I'm in the right and ending up in hand cuffs would make for a great story -- especially if I end up as a guest on a Late Night talk show. Or, if I ever get stuck on a elevator. On the other hand, I have two kids who don't think their dad is guy who needs to be handcuffed in the back seat of a squad car for talking sternly, rationally, and making 100% sense, but with a near imperceptible increase in volume and urgency as the result of some parking tickets. Off my car went. And as a side note, my phone's battery was dead. Seriously. Damn you IOS7. Thankfully, the guy at FedEx Office took pity on me and called a cab so I could get home. Because the City won't release the car until the tickets are paid, the following day I paid the tickets ($300 including the additional fine) plus the fee to bail the car out of impound ($325). 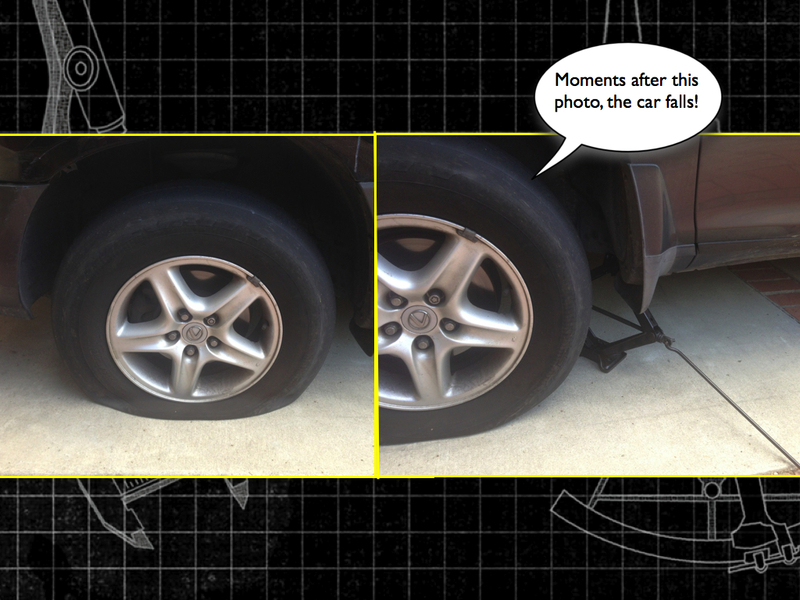 Then, when I finally arrived back home I discovered my front tire was flat -- a nail in it. Retribution from the DMV guy? The Cops? A gift from the impound lot? An unfortunate coincidence while driving home? No idea. Remember, I'm not in the speculation business. Anymore. I make TV. After the car fell off the jack and nearly crushed my foot, I decided to do what I should have done first: pop the other tire, run out and buy a new vehicle and figure out some lie to tell my wife about why my car is gone and I'm now riding a Harley. I'm kidding. I called AAA, who thankfully showed up in about 15 minutes. It was during that time, staring at the car and thinking back 24 hours to when it was booted, the cops showing up, nearly being handcuffed, having the car towed, walking to the AAA office near me to pay my registration fee and then taking a taxi to the impound lot, and finally discovering a flat tire -- that I thought to myself: Jon, you are an idiot! With a hint of desperation in my stride, I was determined to prove myself wrong. That I was not an idiot. That I could accomplish something mechanical without police intervention or help from AAA. So, I decided to build the outdoor movie screen I'd been thinking about for the last few weeks. I had this idea in my head, no idea if it would actually work, but I was determined to find out. You can see how the 10' X 10' backyard movie screen came out in this video below. Jon Hotchkiss is the creator of the new 6-hour science series, This vs That. Click here to see the first 10 minutes of every This vs That episode, FREE.